PURPOSE: To assess the perceptions about ophthalmology as a career among undergraduate medical students and to investigate the determinants of career choice in ophthalmology. METHODS: A questionnaire was administered to all medical students (from 4th year to interns) in King Abdulaziz University, Jeddah, Saudi Arabia. A total of 519 students were included in the study. Students who aspire for ophthalmology as a career, i.e., those who mentioned it in their top three choices (Group A), were compared to those who did not (Group B) regarding demographic and academic factors, factors generally influencing career choice and perception about and experience in ophthalmology. RESULTS: Among 519 included students, ophthalmology was the first career choice of 5.6% and in the top three choices of 13.5% of students. Students from Group A had female preponderance and comparable academic skills, by reference to Group B. Group A reported to have a better experience in ophthalmology, including conference attendance, research activity, and community services related to ophthalmology, as well as greater advantage from ophthalmology rotation. 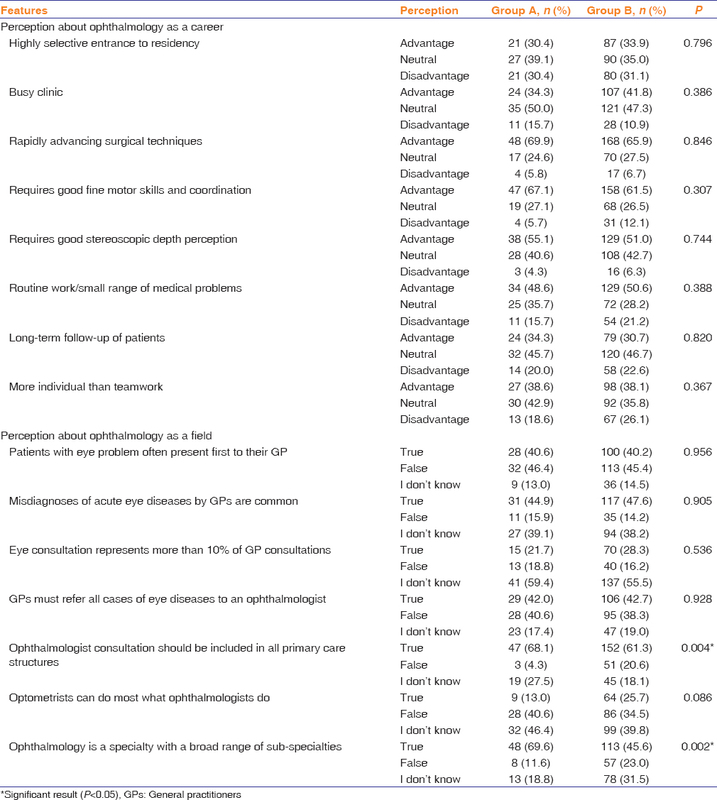 Determinants of career choice in ophthalmology included giving importance for workload during their residency (odds ratio [OR] = 3.38; P = 0.021), having concern about challenging instrumental features (OR = 0.29, P = 0.012), believing that ophthalmology should be included in primary care (OR = 13.60, P = 0.002), and having participated in community service activity in ophthalmology (OR = 10.10, P = 0.005). CONCLUSION: Students who aspire for a career in ophthalmology showed to have an early involvement in related academic activities and less concern about instrumental and intellectual challenges, as compared to their counterparts. The formal ophthalmology rotation is the key step to recruit future ophthalmologists by correcting misconceptions and enhancing interest about the specialty. Many countries have been experiencing an unequal distribution of health-care professionals and severe shortage of health-care staff. Particularly, in the remote areas, the delivery of health-care facilities to vulnerable populations is threatened because of lack of sufficient health-care professionals including nurses and physicians. There has been a sharp decline in the entrance of physicians into family practice and the number of medical students going to primary care residencies. The hospital-related specialties and subspecialties have been preferred by many medical students; still, there is an increasing demand for primary health-care providers. There was a rigorous shortage of around 30,000 primary health-care physicians in the United States, in 2011. In Canada, there is a decrease in the entrance of medical students by almost one-third in the family medicine program and only 20% medical students opt for general practice in France. The undergraduate medical students have to study a broad range of medical specialties to complete the medical education. Most of the time, the medical students decide about their career preferences after the completion of their graduation. Nevertheless, nowadays, medical school entrants along with applicants to the medical education have predecided career preferences and tilt toward some specialties or against some medical specialties. In addition, the range of factors influencing career choice may vary for different specialties.,,,,, Therefore, a lot of research studies are being conducted to figure out the reasons for choosing particular careers, the personal characteristics of those medical students, link with specific personality types, and the background factors pressurizing toward particular career preference. Before the commencement of a professional career, students may formulate some professional and personal interests, in accordance with their values and goals. In most cases, the field of specialty has been selected on the basis of naïve perceptions of that specialty, by inexperienced applicants to residency programs. Although, during residency, the viewpoints of medical students refine with time, in the majority of cases, the initial perceptions are thought to be significant for the career choices. Particularly, for ophthalmology, a great deal of understanding is required to find out the career perceptions and unique capabilities of ophthalmology resident applicants. In Saudi Arabia, ophthalmology is one of the most preferred specialties by undergraduate students,, while not all of them can enter the residency in ophthalmology because of the high competitiveness. This study aims to assess the proportion of undergraduate Saudi medical students who aspire for ophthalmology as a career and to investigate factors influencing such career choice as against other specialties. This study also aims to assess perceptions of undergraduate medical students about ophthalmology as a specialty and whether their perceptions correlate with their career choice. This was a cross-sectional study carried out at King Abdulaziz University (KAU), Jeddah, Saudi Arabia, in October 2015. All 4th-year, 5th-year, and 6th-year medical students and interns affiliated to the Faculty of Medicine of KAU were invited to participate in the study. An auto-questionnaire was designed for the study purpose and was distributed by five volunteers in the main entrance of the Faculty of Medicine and that of the University Hospital for 5 consecutive weekdays. A convenience sampling was used to include all eligible and consenting students. The questionnaire included five parts: Part A, including demographic and academic data as well as the top three specialty choices; Part B, including career expectations, assessing factors that may generally influence the specialty choice, such as length of residency course, workload during residency, role model in the specialty and financial rewards; Part C including perceptions about ophthalmology as a career, exploring student's view (“advantage,” “neutral” or “disadvantage”) regarding different features of ophthalmology as a life career; Part D, including perceptions about ophthalmology as a field, exploring student's knowledge and belief (“true,” “false,” or “I don't know”) regarding different statements about ophthalmology; and Part E, including experience in ophthalmology, including conference attendance, research participation, and community service activity related to ophthalmology, as well as an assessment of the impact of ophthalmology rotation on the student's opinion about ophthalmology. The questionnaire underwent face and content validity with the participation of the authors, a research methodologist and an ophthalmology consultant who were not involved in the study. In addition, internal consistency of the questionnaire was calculated with a Cronbach's alpha = 0.743. According to the mention of ophthalmology among the top three specialty choices or not (part A of the questionnaire), students were classified into Group A or Group B, respectively. Thus, Group A included students who aspire to be ophthalmologists, while Group B included students who do not aspire to be ophthalmologists but look for other specialties as a career. To analyze the factors associated with career choice in ophthalmology, Group A was compared with Group B regarding demographic and academic data (Part A of the questionnaire), factors influencing career choice (Part B), perceptions about ophthalmology as a career and as a field (Parts C and D), and experience in ophthalmology including the impact of ophthalmology rotation (Part E). Students who have not reported their three specialty choices were excluded from this analysis. Statistical analysis was performed using Statistical Package for the Social Sciences version 16.0 for Windows (SPSS Inc., Chicago, IL, USA). Descriptive statistics were used to explore the demographic data of the participants as well as the pattern of answers to the different questionnaire items. Frequencies and percentage were calculated for categorical variables and means and standard deviations (SD) were calculated for continuous variables. Correlations between categorical variables were analyzed using Pearson's Chi-square test, while comparison of means was analyzed using Student's t-test or one-way analysis of variance (ANOVA) as appropriate. Binary logistic regression was carried to analyze the predictability of career choice and the dependent variable, by the presumed factors in univariate and multivariate models, and the results were presented as odds ratio (OR) with 95% confidence interval (95% CI). P < 0.05 was considered statistically significant. The study recruited 519 students (male:female ratio = 1:1.58, mean [SD] age = 22.1 [ ±1.30] years) distributed as following: 37.4% in the 4th year, 31.0% in the 5th year, 22.0% in the 6th year, and 8.9% interns. Assessments of career choice showed ophthalmology as the first choice in 29 (5.6%) students and as one of the top three choices in 70 (13.5%). After excluding students who expressed no specialty choice yet (n = 190), comparison between students who had ophthalmology in their top three choices (Group A, n = 70) and those who did not (Group B, n = 259) showed a female preponderance in Group A, with 72.9% females (male ratio = 1:2.68) versus 55.6% (male ratio = 1:1.25) in Group B, (P = 0.009). It also showed a comparable mean GPA (P = 0.556) and ophthalmology score (0.992) and a comparable distribution in marital status (P = 0.646) and grade (P = 0.246) [Table 1]. Analysis of the determinants of career choice in students who aspire to be ophthalmologist versus who do not showed more consideration for workload during their residency (80% vs. 65.6%; P = 0.021) and less consideration regarding the following factors: challenging intellectual features (58.0% vs. 78.7%, P < 0.001), challenging instrumental features (62.3% vs. 78.3%, P = 0.007), and possibility to work in urban center and deal with high class society (46.4% vs. 59.8%, P = 0.045) [Table 2]. Analysis of the determinants of perception about ophthalmology as a career showed no significant relation with the previously reported career choice, i.e., no significant difference between Group A and Group B. For example, highly selective entrance to residency was perceived as an advantage by almost equal proportions of students in Group A (30%) and Group B (33.9%) (P = 0.796). It is worth noting that the requirement of good fine motor skills and coordination for ophthalmology was perceived as a disadvantage by lesser proportion of students from Group A (5.7%) versus Group B (12.1%). Similarly, “routine work/small range of medical problems” was less frequently perceived as a disadvantage in Group A (15.7%) than Group B (21.2%). However, these differences did not reach statistical significance [Table 3]. 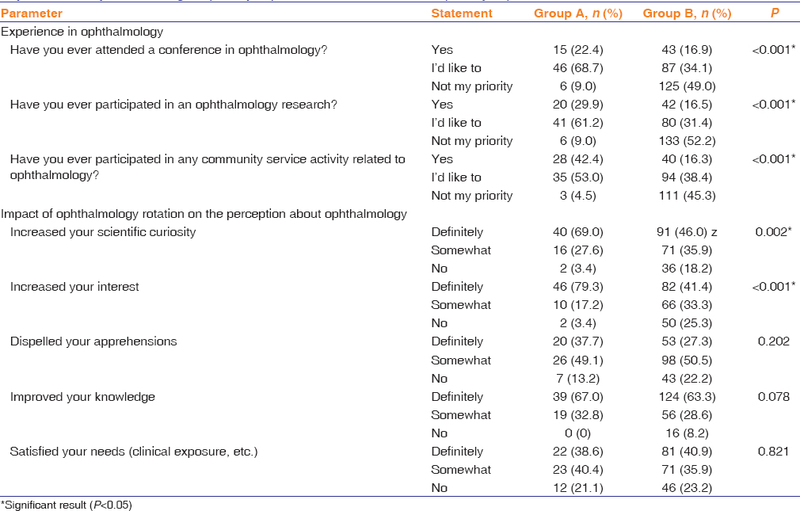 Analysis of the determinants of perceptions about ophthalmology as a field showed that 20.6% of Group B participants opted for “false” when it was inquired that either ophthalmologist consultation should be included in all primary care structures versus 4.3% in Group A (P = 0.004). It was found that 69.6% of Group A participants believed that ophthalmology is a specialty with a broad range of subspecialties versus 45.6% of Group B (P = 0.002). The statement that optometrists can do most what ophthalmologists do was stated as true by 25.7% of students from Group B versus only 13.0 from Group A [Table 3]; however, the difference in the observation was not statistically significant (P = 0.086). Analysis of the students' experience in ophthalmology showed more attendance in conferences (P < 0.001) and more participation in ophthalmology research (P < 0.001) and in community services related to ophthalmology (P < 0.001) in Group A versus Group B. Further analysis showed significantly higher impact of the ophthalmology rotation in students' scientific curiosity (P = 0.002) and interest about ophthalmology (P < 0.001) in Group A as compared to Group B [Table 4]. Regarding the impact of ophthalmology rotation, 69% of Group A students agreed that ophthalmology rotation increased their scientific curiosity; however, only 46.0% of Group B students agreed for that (P = 0.002). Majority (79.3%) of Group A students affirmed that the ophthalmology rotation increased their interest in ophthalmology, in comparison with 41.4% from Group B (P < 0.001) [Table 4]. All of the previous items that showed a significant difference between the two groups in Chi-square analysis were analyzed as predictors for career choice in ophthalmology in univariate and multivariate regression models. 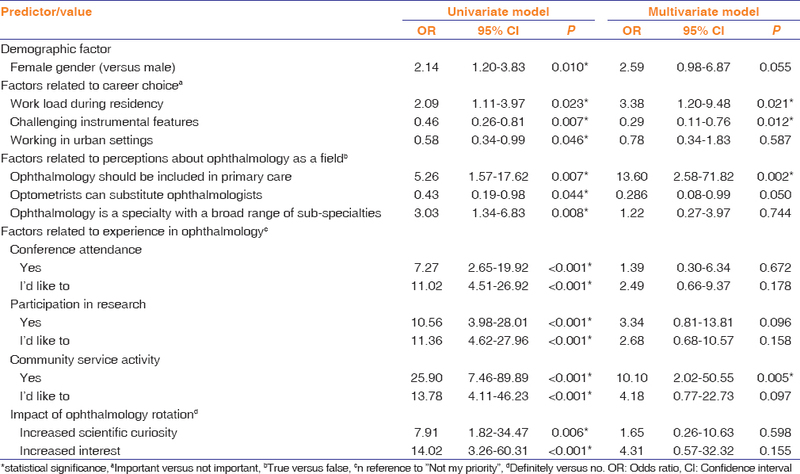 In univariate models, ophthalmology choice was significantly predicted by all the studied factors such as female gender (OR [95% CI] = 2.14 [1.20–3.83], P = 0.010), having attended ophthalmology conference (OR [95% CI] = 7.27 [2.65–19.92], P < 0.001), having participated in an ophthalmology research (OR [95% CI] = 10.56 [3.98–28.01], P < 0.001), and having own scientific curiosity (OR [95% CI] = 7.91 [1.82–34.47], P = 0.006) or interest (OR [95% CI] = 14.02 [3.26–60.31], P < 0.001) in ophthalmology that was increased after ophthalmology rotation. However, only four among those factors remained significant predictors in multivariate analysis including (1) importance given for workload during residency program (OR [95% CI] = 3.38 [1.20–9.48], P = 0.021); (2) importance given for challenging instrumental features (OR [95% CI] = 0.29 [0.11–0.76], P = 0.012); (3) believing that ophthalmology should be included in primary care (OR [95% CI] = 13.60 [2.58–71.82], P = 0.002); and (4) having participated in community service activity in ophthalmology (OR [95% CI] =10.10 [2.02–50.55], P = 0.005) [Table 5]. The present study highlighted the factors specifically associated with career choice in ophthalmology in comparison with the other specialties, as well as factors that are likely to be obstacles in choosing ophthalmology as a career. These results may help develop the strategies to improve recruitment into ophthalmology in case of shortage. The proportion of students who had ophthalmology in their first choice was 5.6% and those who had it in their top three choices was 13.5%, with a distinct female preponderance in the group of students who aspire for ophthalmology as a career. In concordance with our findings, Iftikhar et al. who investigated career choices in the same population (interns and medical students in KAU) reported that ophthalmology was the preferred specialty by 5.8% of the participants whereas 13.2% had a choice for medicine, 11.3% for family medicine, and 10.5% for pediatrics. However, the author did not report a gender discrepancy in ophthalmology choice, while a female preponderance was reported for medicine, family medicine, pediatrics, and cardiology and male students displayed more interest for surgery, neurology, and orthopedics. By contrast to this study's finding, Abdulghani et al. reported that ophthalmology was among the most preferred choices for career field among the senior medical college students, in concurrence with internal medicine, ear, nose, and throat and general surgery. Accordingly, the least preferred choices among the students were forensic medicine, anesthesia, and community medicine. In data reported by Savur, ophthalmology was the first choice in almost 9% and ranked among the three top choices in almost 60% of the interviewed medical interns. In this study, analysis of the determinants of career choice showed more consideration for workload during residency in Group A (80.0%) versus Group B (65.6%) (P = 0.021), while insignificant difference was observed between the two groups regarding the following factors: influence of friends and family, role model in specialty, gender distribution among patients, and technological innovations in the field. In a nationwide Japanese study by Takeda et al., career choice in ophthalmology was associated with job security and bioscientific orientation. On the contrary, another study carried out by Kaliyadan et al. showed that, in a population of students (n = 109) where general surgery was the top choice in 54%, 57% of the total students who strongly agreed that the aspiration for general surgery was due to the primary aptitude in that field. The remaining students perceived that the influence of family and friends, involved challenges, financial awards, and scope for research were significant factors that influence their choice regarding the specialty. Abdulghani et al. figured out that while making final definite choice among medical college students, having a background about concerned specialty was an important factor. Savur who studied perceptions of medical interns in ophthalmology as a career choice reported possibility to have more family time and limited emergency cases as significant factors to choose ophthalmology. We also found that students who aspire to be ophthalmologists were less inclined toward working in urban settings than their peers. Paradoxically, more students who aspire for ophthalmology agreed that the ophthalmologist consultation should be included in all primary health-care structures. In contrast with our results, another study by Alwadani et al. illustrated the trends of practice in the residents of ophthalmology in Saudi Arabia and showed that about half of the respondents wished to continue fellowship in ophthalmology and majority preferred urban settings. Nevertheless, the authors highlighted the need to embolden the ophthalmic practice to be adopted in public institutions. In the same study, the female respondents particularly illustrated that they had a positive electives experience with ophthalmology. Other data by Nallala et al. showed a discrepancy between students from government medical colleges and those from private ones regarding this issue, that is, students from private colleges were less likely to be interested to work in rural areas. The same study showed that students who aspire to study further are more likely to be expecting the urban settings. The outcomes of our study showed that students who do not aspire for ophthalmology (Group B) represented more importance to challenging instrumental features in this field, which could be one of the reasons why they did not perceive it as their career choice when compared to Group A (62% in Group A and 78% in Group B). In addition to this, the requirement of the fine motor skills and coordination was perceived as a disadvantage by 12.1% of students who do not aspire for ophthalmology versus 5.7% of those who chose it. This suggests that the belief that ophthalmology requires fine motor coordination skills and involves challenging instrumental features could represent obstacles for the recruitment of students in this specialty. This is supported by the data from Savur who demonstrated that 41%–56% interns renounced ophthalmology as a career choice because they felt not having the required fine motor and coordination skills or because this specialty is dependent on several diagnostic equipment as per their perception. Such misconceptions may result from different factors including insufficient clinical exposure of students during ophthalmology rotation. According to Savur, consequently, students had biased or inadequate information and knowledge regarding the understanding of this specialty. Regression analysis showed that ophthalmology is likely to be more attractive as a career for students who are not comfortable with hard-working residency program, who participate actively in community service activity in ophthalmology, and aspiring for an openness of the primary health-care centers to ophthalmology consultations. On the other hand, ophthalmology as a career is likely to drive students back who are not comfortable with specialties featuring challenging instrumental work. About one in seven Saudi undergraduate medical students aspire for ophthalmology as a career. These display early interest and involvement in ophthalmology-related academic activities such as research and conferences and or community service activity. On the other hand, Ophthalmology as a career is likely to drive back students who are not comfortable with specialties featuring challenging instrumental work or intellectual capabilities, suggesting that such conception may be a significant obstacle for future applicants to choose ophthalmology. The findings from this study may help develop strategies to improve recruitment into ophthalmology in case of shortage. Formal ophthalmology rotation may be the crucial step to recruit future ophthalmologists, as it represents an experience during which the naive perception of the student is whether confirmed or disproven and after which the natural affinity with this specialty whether either? Waxes or wanes. O'Brien P, Gostin LO. Health worker shortages and inequalities: The reform of United States policy. Glob Health 2008;2. Dikici MF, Yaris F, Topsever P, Tuncay Muge F, Gurel FS, Cubukcu M, et al. Factors affecting choice of specialty among first-year medical students of four universities in different regions of Turkey. Croat Med J 2008;49:415-20. Kirch DG, Henderson MK, Dill MJ. Physician workforce projections in an era of health care reform. Annu Rev Med 2012;63:435-45. Vanasse A, Orzanco MG, Courteau J, Scott S. Attractiveness of family medicine for medical students: Influence of research and debt. Can Fam Physician 2011;57:e216-27. Querido SJ, Vergouw D, Wigersma L, Batenburg RS, De Rond ME, Ten Cate OT, et al. Dynamics of career choice among students in undergraduate medical courses. A BEME systematic review: BEME guide no 33. Med Teach 2016;38:18-29. Avery DM, Wheat JR, McKnight JT, Leeper JD. Factors associated with choosing family medicine as a career specialty: What can we use. Am J Clin Med 2009;6:54-8. Puertas EB, Arósquipa C, Gutiérrez D. Factors that influence a career choice in primary care among medical students from high-, middle-, and low-income countries: A systematic review. Rev Panam Salud Publica 2013;34:351-8. Rehman A, Rehman T, Shaikh MA, Yasmin H, Asif A, Kafil H, et al. Pakistani medical students' specialty preference and the influencing factors. J Pak Med Assoc 2011;61:713-8. Stagg P, Prideaux D, Greenhill J, Sweet L. Are medical students influenced by preceptors in making career choices, and if so how? A systematic review. Rural Remote Health 2012;12:1832. Jones P, Rai BP, Qazi HA, Somani BK, Nabi G. Perception, career choice and self-efficacy of UK medical students and junior doctors in urology. Can Urol Assoc J 2015;9:E573-8. Knox KE, Getzin A, Bergum A, McBride P, Rieselbach R, Friedsam D, et al. Short report: Factors that affect specialty choice and career plans of Wisconsin's medical students. WMJ 2008;107:369-73. Khater-Menassa B, Major S. Factors influencing the choice of specialty among medical students in Lebanon. J Med Liban 2005;53:16-20. Johnson AL, Sharma J, Chinchilli VM, Emery SE, McCollister Evarts C, Floyd MW, et al. Why do medical students choose orthopaedics as a career? J Bone Joint Surg Am 2012;94:e78. Elzain YI, Alawad AA, Khan WS, Khalil HO, Abdelrazig YM, Ahmed OB, et al. Factors influencing the choice of internal medicine as a career among undergraduate medical students. Int J Health 2014;2:22-5. Saigal P, Takemura Y, Nishiue T, Fetters MD. Factors considered by medical students when formulating their specialty preferences in Japan: Findings from a qualitative study. BMC Med Educ 2007;7:31. Takeda Y, Morio K, Snell L, Otaki J, Takahashi M, Kai I, et al. Characteristic profiles among students and junior doctors with specific career preferences. BMC Med Educ 2013;13:125. Aydin S, Yaris F, Sahin ME, Ozer C, Ozkomur E. Students'perceptions of their undergraduate medical education. Saudi Med J 2005;26:1484-6. Khader Y, Al-Zoubi D, Amarin Z, Alkafagei A, Khasawneh M, Burgan S, et al. Factors affecting medical students in formulating their specialty preferences in Jordan. BMC Med Educ 2008;8:32. Mehmood SI, Kumar A, Al-Binali A, Borleffs JC. Specialty preferences: Trends and perceptions among Saudi undergraduate medical students. Med Teach 2012;34 Suppl 1:S51-60. Abdulghani HM, Al-Shaikh G, Alhujayri AK, Alohaideb NS, Alsaeed HA, Alshohayeb IS, et al. What determines the selection of undergraduate medical students to the specialty of their future careers? Med Teach 2013;35 Suppl 1:S25-30. Iftikhar R, Alkhail BA, Alkhail YB, Alkhail MB. More internists, family physicians, and paediatricians and less obstetricians/gynaecologists: Challenges to the workforce. Life Sci J 2015;12. Savur SA. Chasing a postgraduate degree in ophthalmology: The medical intern's perspective. J Clin Diagn Res 2012;6. Kaliyadan F, Amin TT, Qureshi H, Al Wadani F. Specialty preferences of 1st year medical students in a Saudi medical school – Factors affecting these choices and the influence of gender. Avicenna J Med 2015;5:134-9. Alwadani F, Alrushood A, Altokhy H, Alasbali T. A forecast of ophthalmology practice trends in Saudi Arabia: A survey of junior residents. Middle East Afr J Ophthalmol 2010;17:343-8. Nallala S, Swain S, Das S, Kasam SK, Pati S. Why medical students do not like to join rural health service? An exploratory study in India. J Family Community Med 2015;22:111-7.